Meteor activity increases in October when compared to September. A major shower (the Orionids) is active all month long and there are also many minor showers to be seen. Both branches of the Taurids become more active as the month progresses, providing slow, graceful meteors to the nighttime scene. The Orionids are the big story of the month reaching maximum activity on the 22nd. This display can be seen equally well from both hemispheres which definitely helps out observers located in the sporadic-poor southern hemisphere this time of year. During this period the moon reaches its last quarter phase on Sunday October 4th. On that date the moon will be located 90 degrees west of the sun and will rise near 2300 (11pm) local daylight saving time as seen from mid-northern latitudes. The moon will still be bright but successful meteor observations can still be undertaken as long as you keep the moon out of your field of view. As the week progresses the moon’s phase will wane and it will rise later in the morning with each passing night. The estimated total hourly meteor rates for evening observers this week is near 3 as seen from mid-northern latitudes (45N) and 2 as seen from tropical southern locations (25S). For morning observers the estimated total hourly rates should be near 15 as seen from mid-northern latitudes (45N) and 10 as seen from tropical southern locations (25S). Morning rates are slightly reduced during this period due to interfering moonlight. The actual rates will also depend on factors such as perso nal light and motion perception, local weather conditions, alertness and experience in watching meteor activity. Note that the hourly rates listed below are estimates as viewed from dark sky sites away from urban light sources. Observers viewing from urban areas will see less activity as only the brightest meteors will be visible from such locations. The radiant (the area of the sky where meteors appear to shoot from) positions and rates listed below are exact for Saturday night/Sunday morning October 3/4. These positions do not change greatly day to day so the listed coordinates may be used during this entire period. Most star atlases (available at science stores and planetariums) will provide maps with grid lines of the celestial coordinates so that you may find out exactly where these positions are located in the sky. Rather they shoot outwards from the radiant so it is best to center your field of view so that the radiant lies at the edge and not the center. V iewing there will allow you to easily trace the path of each meteor back to the radiant (if it is a shower member) or in another direction if it is a sporadic. Meteor activity is not seen from radiants that are located below the horizon. The positions below are listed in a west to east manner in order of right ascension (celestial longitude). The positions listed first are located further west therefore are accessible earlier in the night while those listed further down the list rise later in the night. 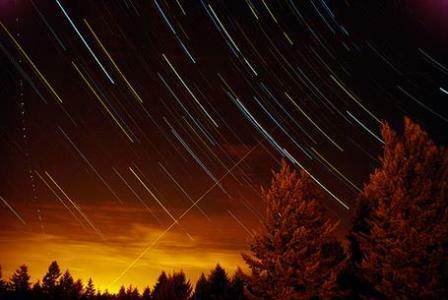 The Draconids (GIA) are expected to be active on five evenings from October 6-10. The normal maximum is expected to occur anywhere from 21:00 UT October 8 to 1500 UT October 9. The radiant lies at 17:28 (262) +56. This position lies in southeastern Draco, very close to the position occupied by the faint star known as Kuma (Nu Draconis). This activity is best seen just as soon as it becomes totally dark. The expected hourly rates are a guess ranging from 0-5, most likely 0-1. With an entry velocity of 19 km/sec., the average Draconid meteor would be of very slow velocity. These meteors are poorly seen from the southern hemisphere due to the low radiant altitude seen from below the equator. The Southern Taurids (STA) are currently active from a radiant located at 01:48 (027) +08. This position lies in southeastern Pisces, close to the faint star known as Omicron Piscium. These meteors may be seen all night long but the radiant is best placed near 0200 LDT when it lies on the meridian and is located highest in the sky. Rates at this time should be near 3 per hour regardless of your location. With an entry velocity of 29 km/sec., the average Southern Taurid meteor would be of slow velocity. The Orionids (ORI) are active from a radiant at 05:36 (084) +14, which places it in northern Orion, 3 degrees northeast of the 3rd magnitude star known as Meissa (Lambda Orionis). This area of the sky is best placed during the last hour before dawn, when it lies highest above the horizon in a dark sky. Rates this week would be near 2 per hour no matter your location. With an entry velocity of 67 km/sec., most activity from this radiant would be of swift speed. Recent analysis of the IMO video database has shown that the Epsilon Geminids (EGE) are active as early as September 29. The current radiant position would be located near 05:48 (087) +30, which places it in southern Auriga, 5 degrees west of the 4th magnitude star known as Kappa Aurigae. This area of the sky is best placed in the sky during the last hour before dawn, when it lies highest above the horizon in a dark sky. Current rates should be near 1 per hour as seen from the northern hemisphere and less than 1 when view south of the equator. With an entry velocity of 70 km/sec., most activity from this radiant would be of swift speed. The Daytime Sextantids (DSX) are mainly thought of as a daylight shower, only visible by radio and radar means. Actually the radiant lies slightly more than 30 degrees west of the sun and members of this shower should be visible during the last hour before the start of nautical twilight, when the sun lies 12 degrees below the horizon. Shower members would shoot upwards from the eastern horizon as dawn is breaking. The International Meteor Organization is asking observers to try and view activity from this source between September 25 and October 6. Maximum activity is thought to occur on September 29th. The radiant should be considered to lie at 10:16 (154) -01. This position lies in central Sextans, 3 degrees east of the 4th magnitude star known as Alpha Sextantis. This area also lies a dozen degrees south of the bright star Regulus (Alpha Leonis). This is one of the stronger “daytime” showers so the visual observer may see several meteors from this source each morning during the period mentioned above. With an entry velocity of 33 km/sec., most activity from this radiant would be of medium-slow velocity. These meteors can be seen equally well from both hemispheres. The October Camelopardalids (OCT) were first noticed by Peter Jenniskens and mentioned in his book Meteor Showers and their Parent Comets. IMO video data has confirmed this activity which is short-lived and best seen on the mornings of October 5 and 6. The radiant lies at 11:12 (168) +79, which places it in a very remote portion of eastern Camelopardalis. The easiest way to pinpoint this radiant is to draw a line through the bottom of the “Little Dipper” (Gamma and Beta Ursae Minoris) westward. Draw another line from the “pointers” in the “Big Dipper” (Alpha and Beta Ursae Majoris) and extend it northward Polaris. Where these 2 lines intersect will be close to the OCT radiant. This area of the sky is above the horizon most of the night for most observers in the northern hemisphere but is best placed in the sky during the last hour before dawn, when it lies highest above the horizon. Rates at maximum would be near 1 per hour as seen from the northern hemisphere. These meteor s are basically invisible from locations south of the equator. With an entry velocity of 44 km/sec., most activity from this radiant would be of medium velocity. As seen from the mid-northern hemisphere (45N) one would expect to see approximately 8 sporadic meteors per hour during the last hour before dawn as seen from rural observing sites. Evening rates would be near 2 per hour. As seen from the tropical southern latitudes (25S) morning rates would be near 5 per hour as seen from rural observing sites and 1 per hour during the evening hours. Locations between these two extremes would see activity between the listed figures. Note that sporadic rates are slightly reduced this week during the morning hours due to moonlight. This entry was posted in Astronomy and tagged American Meteor Society, Draconids, Orionids meteor shower, Taurids. Bookmark the permalink.